by living and learning together. the leader of one’s life and growth through an unending education. Learning is an intensely personal affair and a function of necessity. It is an inner dialogue that one has with life. Through the varied dynamics of this dialogue, one grows as a human being through life long explorations, discoveries and understandings. The process of learning is of equal importance as the product. We aim at integrality and cannot involve only one part or function of our being. We aim to keep alive the deeper potential of the individual, and prepare him/her as integrally as possible for the future. This way each can grow into a balanced and harmonious being, who can contribute to the making of a reflective and integral society. We wish for each individual to come to an understanding of the true purpose and significance of human life, both children and adults. This purpose serves as a lasting source of inspiration that carries us at every stage of our lives. Our work is guided by Sri Aurobindo’s three principles of education through a free progress methodology. TLC is not a school but a Learning Community because everybody is a lifelong learner, children and adults alike. No one is imparting knowledge to another, but learning happens everywhere and is a continuous process that emerges through interaction, and results in mutual transformation. This goes beyond the boundaries of the classroom and includes the home and larger community. Everyday life and every moment is the best school of all: varied, complex, full of unexpected experiences, problems to be solved, clear and striking examples and obvious consequences. Besides being an ideal platform for learning, the collective at TLC has intrinsic value in and of itself. We recognize the interdependence of all human beings and hold dear the principles of unity in diversity, of harmony, solidarity and care. This is reflected in the way we behave with each other, in how we make decisions, face their consequences and set priorities. In 2008 TLC was formed by a small group of diverse yet like-minded people around this common vision. 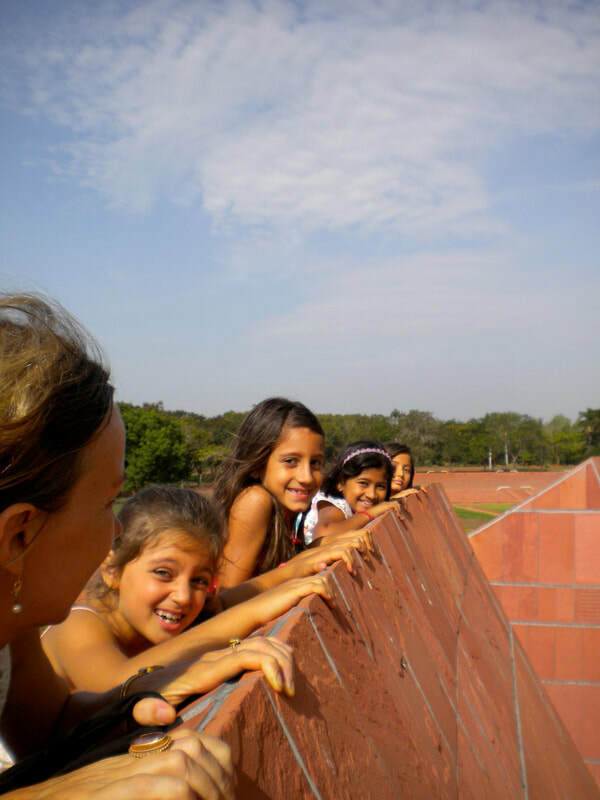 We widened the learning field from a classroom to the larger community of Auroville and, through this exposure to different communities and environments within Auroville, we naturally engaged in a process of learning and building community. Growing numbers brought their own challenges such as logistics, communication, etc. Therefore, in 2012 Base Camp was established. Though this physical campus gives us many opportunities, it is important to note that Base Camp is not the final destination, but a launch pad to venture further. Base Camp is not viewed as a school campus with classrooms, but a real-life opportunity for our community to grow together, to coordinate and collaborate. Maintaining a campus and being a part of a community offers many different ways for parents and children to get involved and take initiative and responsibility. It is important to acknowledge that where we are today is not the end. TLC is ever-changing and we constantly re-look at our aspiration and progress towards the vision. To keep this evolving organism alive asks for an eager curiosity, acceptance, openness for change, self evaluation and dialogue amongst all members of the community.